Dining right on the water in Hope Island, you and your taste buds will be taken on a delightful eastern journey. Enjoy your night out with family, friends or that very special occasion. 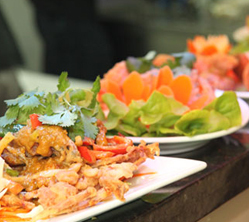 Thai food is a favorite of many, we keep to traditional recipes including our house specialties like soft shell crab and steamed whole barramundi, while still serving up everyone’s favourite Thai curries. With our sophisticated setting and authentic fresh and healthy cuisine you may be surprised at how inexpensive our prices are for both dine in and takeaway. 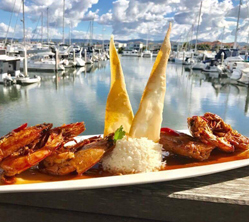 Enjoy this 5 star dining experience without the price tag. Treat yourself to a Friday or Saturday night drink and dinner with our resident pianist, creating a romantic atmosphere that will delight both young and old. 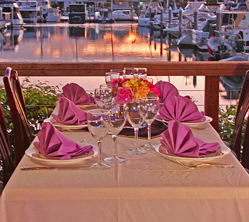 With seating overlooking the peer, our location is both tranquil and relaxing. Enjoy breathtaking sunsets over the Marina where our highly trained team offer impeccable service, so you can sit back, relax and enjoy the company of others. We guarantee you will enjoy our food, service and stunning atmosphere, and we hope to see you soon at the House of Siam.